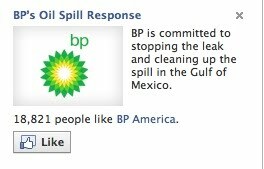 Who knew BP was even that popular? Almost 19,000 fans for BP. Huh. Yes, I'm doing this in hopes that Google Ads will dump some BP ads on me, so you can click on them, and I can do my part to drain a few pennies from BP. That's British Petroleum. Got that Google Ads? British Petroleum.